Wind power is increasing rapidly worldwide, even more so in Germany. Their experience indicates expenses and problems accompany this increase. Their work will help other countries in a worldwide shift to increasing use of wind power. First, an explanation of capacity. A 1,000 MW** power plant operating for one hour at full capacity makes one million kWh of electricity. However, power plants don’t operate at full capacity, as they must be repaired, or in the case of nuclear power plants, shut down for refueling. Coal and nuclear power plants (base load) run 24 hours/day, while natural gas (often peak load) run as needed, as they are much easier to turn on and off. The same is true of hydroelectric power. In the US, nuclear power plants operate at 90% capacity, coal at 73% (more down time for maintenance and failures), natural gas plants (depending on type) from 16 – 38%, hydroelectric at 29%, wind at 27%, solar at 19%, and geothermal at 76%. Again, the lower capacity of natural gas and hydroelectric plants occurs because most are turned off at night and other times of low usage. The wind doesn’t blow all of the time, and speed varies. Since energy produced is proportional to speed cubed, when speed goes down by half, electricity production goes down by seven eighths. Solar panels are without light half the day (more in Berkeley), and not facing the sun directly much of it. Solar panels also degrade with time. To calculate how much capacity must be built in order to produce 1,000 MW power, divide by the capacity factor: build a 1,100 MW nuclear power plant, 1,400 MW coal, 4,000 MW wind, 5,000 MW solar, etc. • Wind energy is only able to replace traditional power stations to a limited extent. Especially cold or hot weather is usually accompanied by relatively windless days, limiting wind’s contribution when it is most needed (much of Europe uses electricity for heating because of the dangers of natural gas). During much of California’s heat wave in mid-July, capacity fell to 5% or less. The average wind power in Germany is 1/5 of wind capacity (less wind? ), but this is skewed by windy times. For the majority of the year, wind capacity is less than 14%. Because guaranteed wind power is so low, backup power plants must be built – almost as many as if there were no wind power. (Hydroelectric and natural gas are good backups for wind, but not coal or nuclear power plants, which run all day.) Moreover, the need for backup plants increases as use of wind power increases. By 2020, Germany is due to have 48,000 MW in windmills, equivalent to 9,600 MW in power plants on all the time. However, Germany will need 46,000 MW in backup to guarantee 48,000 MW in power – rarely, the majority of this will come from wind, but on the majority of days, almost all of this will come from the backup plants. Building windmills doesn’t mean building fewer other power plants, though it does reduce the amount of natural gas they use. Building so much extra infrastructure is expensive, and is not currently factored into the price of wind power. • Wind power feed-in can only be forecast to a limited degree. Grid failure occurs if electricity taken out of the grid does not exactly equal electricity added to the grid. Since weather forecasts are of limited accuracy, more complex methods to aid decision-making must be employed. This can be tricky. Wind speeds can change rapidly. Over 10 hours one Christmas Eve, wind power decreased from 6,000 MW to 2,000 MW, requiring 4,000 MW of electricity to be added to the grid from other sources. • Wind power needs a grid infrastructure. Germany currently has a distributed electricity supply, that is, most electricity is made close to where it is used, and many power lines operate in only one direction. Integrating more wind power into the grid will require significant transfer between regions, and 1,700 more miles of high voltage power lines by 2020. There are technical challenges as well: distinguishing between a drop in wind power and a fault in the electric grid. Wind power from Germany is affecting neighboring grid operators, particularly in the Netherlands, Poland, and the Czech Republic. Thanks to E.ON Netz for translating the report into English. California built a large number of early windmills, expensive for California but a source of good information for the world. 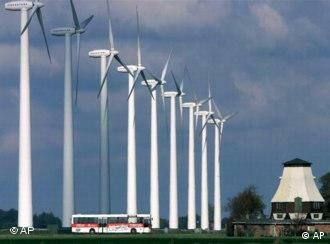 Germany’s rapid upgrade in wind power will be similarly helpful. E.ON Netz focuses on grid problems, as that is their challenge. Other problems, such as bird kills, have been dealt with by changing designs – large bird kills in the Altamont Pass in California were caused by a few of the early windmills. Bat kills are still a puzzle, but solutions are expected. Wind power has another problem I haven’t seen addressed in policy decisions: by taking kinetic energy and water out of the atmosphere, wind power can cause regional climate change, so may be unattractive in some areas. See David Keith’s short overview on Wind Power and Climate Change, or download the longer National Academy of Science study. Currently, this concern is in the “more work is needed” stage, which doesn’t mean that it isn’t serious. * National Wind Technology Center gives different values. Wind resource classes are defined by average wind power density normalized to a standard height of 33 feet (10 meters) above ground. Class 3 wind resources, with average annual wind speed of 12 miles per hour, are assumed to be marginal for utility-scale wind development and beyond the reach of current technology. Class 4 resources, with 13 miles per hour average wind speed, are considered good and are targeted by the DOE’s (US Department of Energy) Low Wind Speed Technology Project with a goal of having commercial wind technology capable of generating power at 3 cents per kWh by 2012. Class 4 resources are available in 36 of the 48 continental states. Class 5 resources have an annual average wind speed of 14 miles per hour and are considered excellent wind resources. Class 6 and higher wind resources, with an annual average wind speed of 15 miles per hour or greater, are considered outstanding. • By 2007, reduce cost of electricity in Class 3 systems to 10 – 15 cent/kWh. • By 2010, facilitate 100 MW of wind power in 30 states. • By 2012, reduce cost in class 4 onshore systems to 3.6 cent/kWh. • By 2016, reduce cost in class 6 systems to 5 cent/kWh for transitional (up to 200 ft depths) offshore systems. Offshore wind power in Denmark. This entry was posted on Sunday, November 12th, 2006 at 10:50 am and is filed under General. You can follow any responses to this entry through the RSS 2.0 feed. Both comments and pings are currently closed. Thanks — this is very helpful for understanding how to evaluate wind power production — I’m a bit depressed by the number of problems, actual and potential and hope this doesn’t mean we can’t count on help from this energy source — Like everything else, problems don’t mean there are no solutions. But it does seem important to realize WIND can solve only a limited number of our energy woes! Dear Muser, This is exceedingly helpful. Sorry I asked you questions on some of this by e-mail without reading this post first. I am using you as an index to your blog, thus visit particular pages as directed. I will see if in fact it is self-indexing. So wind will merely prolong our dependence on fossil fuels and provide confusion about what will really help us lower emissions? One would think traditional powers sources will have longer lives, becausethey will be utilized at a lower percentage of peak power load.